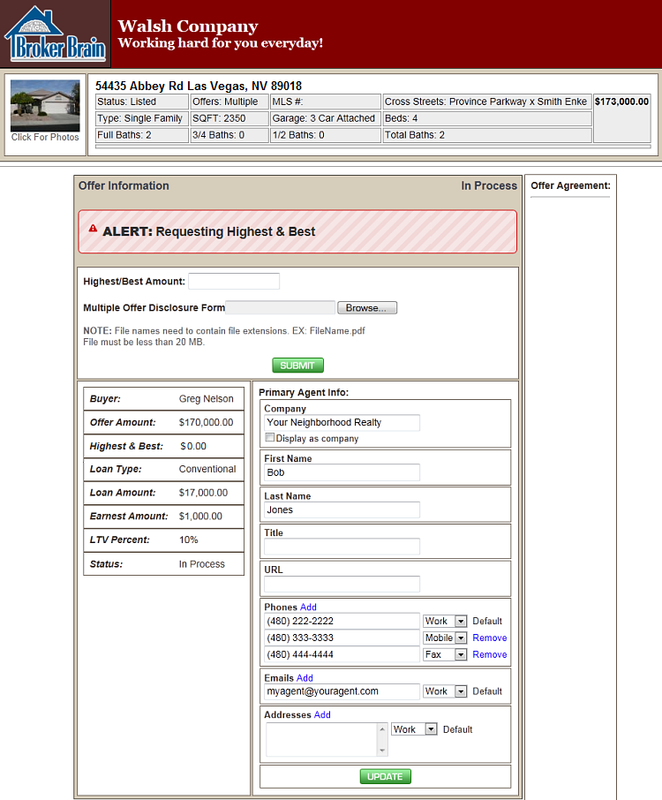 You can use Broker Brain to request a Highest/Best offer. 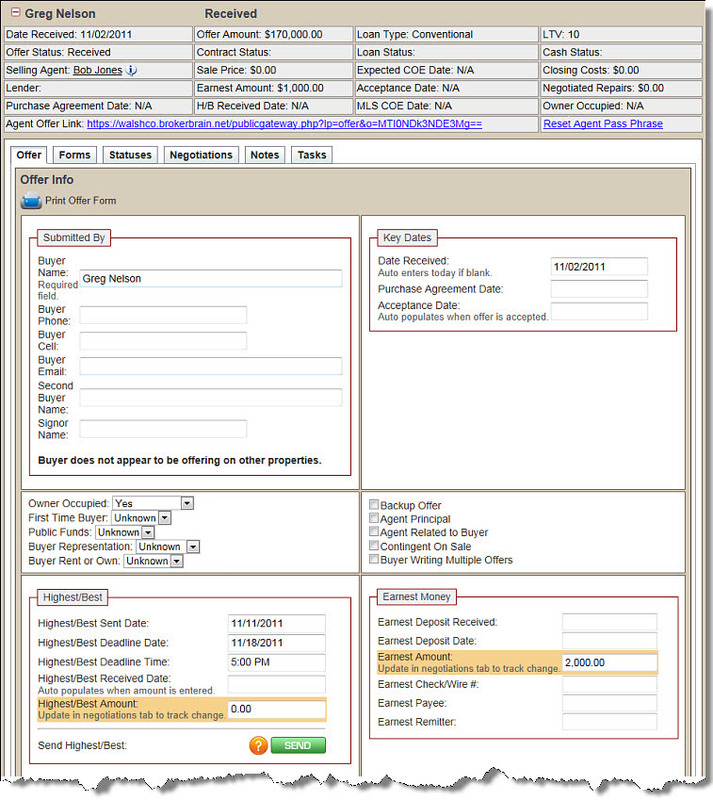 The system will send the selling agent an email with a Multiple Offer Procedure Form attached, along with an agent offer link they can click to see current offer status, update contact information, and submit an updated offer. 1. From the Properties tab, open the desired property. 2. Click the Offers tab (at left). 4. Click the green Send button in the Highest/Best section of the screen. An email screen will appear (as shown below). 5. Scroll up near the top of the email screen and, in the appropriate boxes, add in a deadline date and time for offer acceptance. The Deadline Date and Time initially entered will be enforced within the Broker Brain system, such that offers will not be accepted past that time. Should you wish to extend the deadline, you may change the date and/or time shown in the Highest/Best section of the Offer Screen shown above (be sure to click UPDATE at the bottom of the screen to save your changes). Broker Brain will then accept offers through the new date, and the public website deadline will be extended. This will not, however, update the MODF or email the selling agent regarding the deadline extension. 6. Add any other desired email content, then click SUBMIT. Once the email is sent, the deadline date and time entered in the email will automatically populate those fields in the Highest/Best Offer section of the Offer screen. An email will be sent to the Selling Agent with a Multiple Offer Procedure Form attached and a link to the property information within Broker Brain, where they can submit a new Multiple Offer Disclosure Form (MODF). When the agent clicks the agent offer link to view offer information in Broker Brain, an ALERT will appear at the top of their screen to notify them of the Highest/Best request. Once they enter a Highest/Best amount and submit a new MODF, the ALERT will disappear. 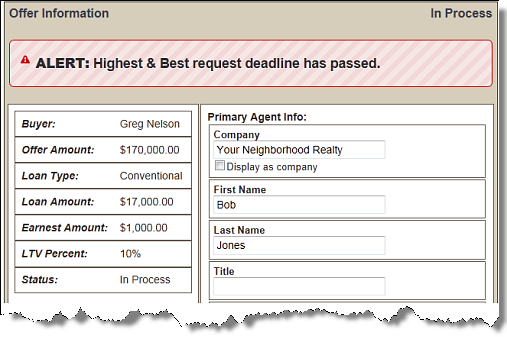 Once the Highest/Best deadline has expired, agents will see the following alert when they click the agent offer link. Note that the Highest/Best Amount field and the MODF browse option have been removed. At this point it is no longer possible for the agent to submit a Highest/Best offer. 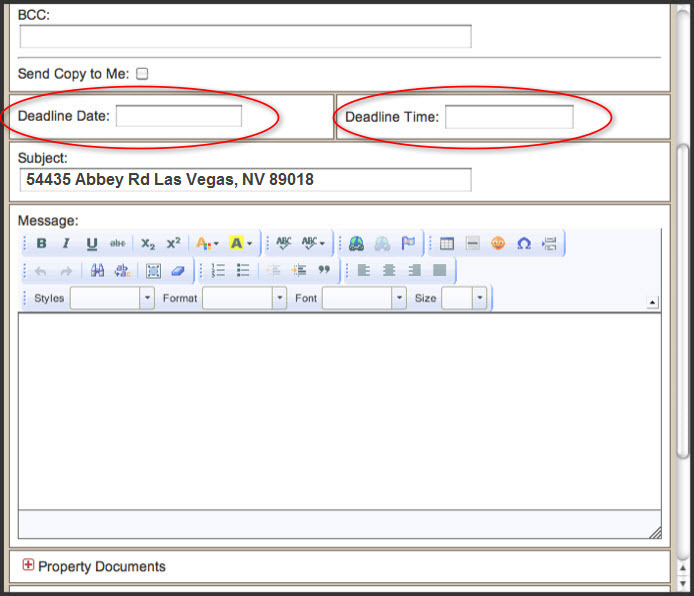 This can only be done if you extend the Highest/Best Deadline Date and Time as discussed in #2 above.